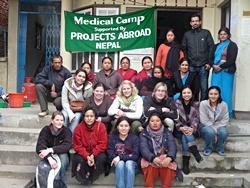 Medical volunteers in Nepal were able to attend a gynecology medical camp for a day on the 16th January. The camp was organized and funded by Projects Abroad in association with Dholahiti Community Health Services Center and was located 45 minutes from Kathmandu in a small village near Patan. The day offered a great learning experience for the five medical volunteers who took part. In addition the four Nepalese doctors saw 150 patients that day.